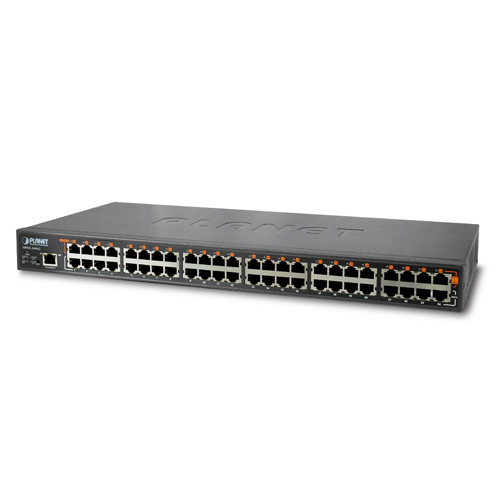 Highly cost-effective upgrade for HPOE-2400G – More PoE budget!!! PLANET HPOE-2400G, the next generation 24-Port Gigabit IEEE 802.3at High Power PoE Web Management Injector Hub, features both IEEE 802.3af and High Power IEEE 802.3at Power over Ethernet (PoE) that combines up to 30-watt power output and data per port over one CAT 5E/6 Ethernet cable. It is designed specifically to satisfy the growing demand for higher power consuming network PD (powered devices) such as PTZ (Pan, Tilt & Zoom) / Speed Dome network cameras, multi-channel (802.11a/b/g/n) wireless LAN access points and other network devices by providing double amount of PoE power, more than the conventional 802.3af PoE PSE.PLANET HPOE-2400G, the 24-port Gigabit IEEE 802.3at High Power PoE Web Management Injector Hub, features both IEEE 802.3af and High Power IEEE 802.3at Power over Ethernet (PoE) that combines up to 30-watt power output and data per port over one CAT 5E/6 Ethernet cable. It is designed specifically to meet the growing demand of higher power consuming network PD (powered devices) such as PTZ (Pan, Tilt & Zoom) / speed dome network cameras, multi-channel (802.11a/b/g/n) wireless LAN access points and other network devices by providing double amount of PoE power than the conventional 802.3af PoE PSE. Till today, the IEEE 802.3af Power over Ethernet Standard has become popular yet the PoE demand still grows for increasing network-powered applications. With many critical applications increases, the demand for higher power appears. Hence, the IEEE 802.3at Power over Ethernet standard is defined to allow delivery of maximum up to 30-watt input power to per PoE device. The IEEE 802.3at PoE standard is an ideal solution to meeting the high power requirements directly via the RJ-45 Port interface. Compliant with IEEE 802.3at, the HPOE-2400G possesses stronger power capability than the existing 802.3af PoE PSE. PLANET R&D team is here to improve and create new Managed PoE products, adopting not only Power over Ethernet technology, but also automated PD (powered device) monitoring and real-time PoE status. The HPOE-2400G can be configured to monitor connected PD status in real-time via ping action. Once the PD stops working and responding, the HPOE-2400G will recycle the PoE port power and bring the PD back to work. It will greatly enhance the network reliability through the PoE port resetting the PD’s power source and reducing administrator management burden. Under the trend of energy saving worldwide and contribute to environment protection on the earth, the HPOE-2400G can effectively control the power supply besides its capability of giving high watts power. The “PoE schedule” function helps you to enable or disable PoE power feeding for each PoE port during specified time intervals and it is a powerful function to help SMBs or enterprises save power and money. To facilitate power management, the HPOE-2400G comes with powerful PoE management features such as over temperature protection, usage threshold alert and auto power allocation to prevent power budget overloading. The PoE power budget can be allocated by priorities or classification and sent alert event logs when power usage reaches the defined threshold. The HPOE-2400G enables centralization of the power supply and optimizes the installation and power management of remote network devices; therefore, it eliminates costs for additional AC wiring and reduces installation time. The HPOE-2400G complies with IEEE 802.3, IEEE 802.3u, IEEE 802.3ab, IEEE 802.3af standards and IEEE 802.3at standard. With 24 10/100/1000Base-T Gigabit Ethernet ports, the HPOE-2400G supports 52V DC power for any remote 802.3af / 802.3at powered device (PD). Supporting PoE power budget of 460 Watts, the HPOE-2400G provides sufficient 15.4 / 30.8-watt PoE power to up to 24 remote PD devices. The HPOE-2400G is installed between a regular Ethernet Switch and the powered devices; it injects power to the PDs without affecting data transmission performance. It offers a cost effective and quick solution to upgrading network system to IEEE 802.3af/IEEE 802.3at Power over Ethernet system without replacing the existing Ethernet Switch. There are 48 RJ-45 STP ports on the front panel of the POE-2400G, of which the 24 ports are on the lower stack function as “Data input” and the other 24 ports are on the upper stack function as “PoE (Data and Power) output”. The 24 “PoE output” ports are also the power injectors that transmit DC voltage to the CAT 5/5e/6 cable and transfer data and power simultaneously between the Injectors and Splitters. To efficiently manage the powered devices, the HPOE-2400G provides simple Web management interface in which administrators can control the functions including port Enable / Disable, port priority, system configuration, change of User Name/Password and smart features for powered devices. The PoE injector hub can automatically detect the power status of each port and show messages on its Web management interface. These features also provide users with a cost-effective way to manage the device via Internet whenever they are at work or at home. The HPOE-2400G provides the easiest way to power your Ethernet devices such as IP camera on the ceiling and the wireless access point installed on the top of the building. With 24 10/100/1000Base-T Gigabit Ethernet ports, the HPOE-2400G supports full 52V DC power for any remote IEEE 802.3af / 802.3at powered device (PD).To control the power system of your networking devices, the HPOE-2400G can directly co-work with PoE IP phone to build VoIP telephony network in the office. Furthermore, the HPOE-2400G can be directly connected to any third party IEEE 802.3af / 802.3at compliant devices installed 100 meters away.